The original BioShock is one of my favourite games of this console generation. When the subject of incredible moments in video games arises, BioShock’s “Would you kindly…” immediately comes to mind. I couldn’t bring myself to play BioShock 2, as I knew it wouldn’t meet my expectations. 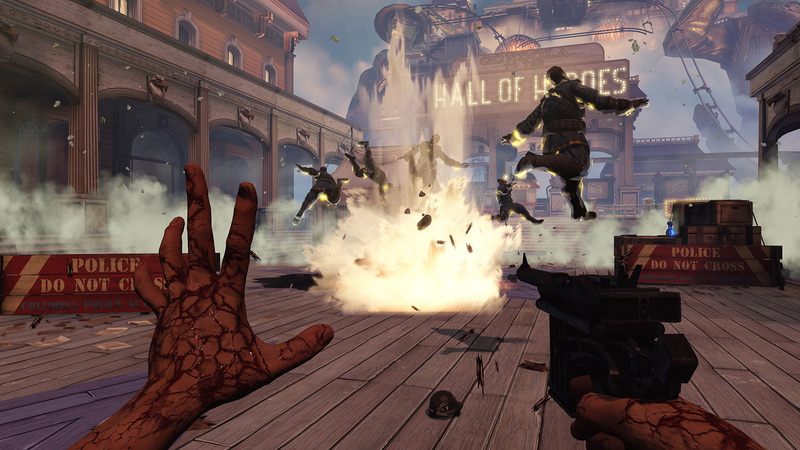 I was sold on BioShock Infinite however, right from the first trailer. The visual style and the concept of a city in the clouds, combined with what was sure to be a solid story, had me yearning for this game for quite literally, years. Actual in-game screenshot. Notice the health bar in the top left corner. 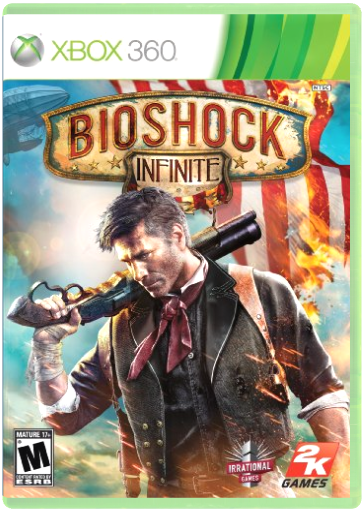 BioShock Infinite is set in 1912, and you assume the role of a character named Booker DeWitt. From the beginning, it’s revealed the he has been sent to Columbia (the floating city) to retrieve a girl named Elizabeth, in order to pay off a debt. The opening scene is very similar to BioShock, in that Booker ends up at a lighthouse and is given a care package containing some necessary objects for his quest. 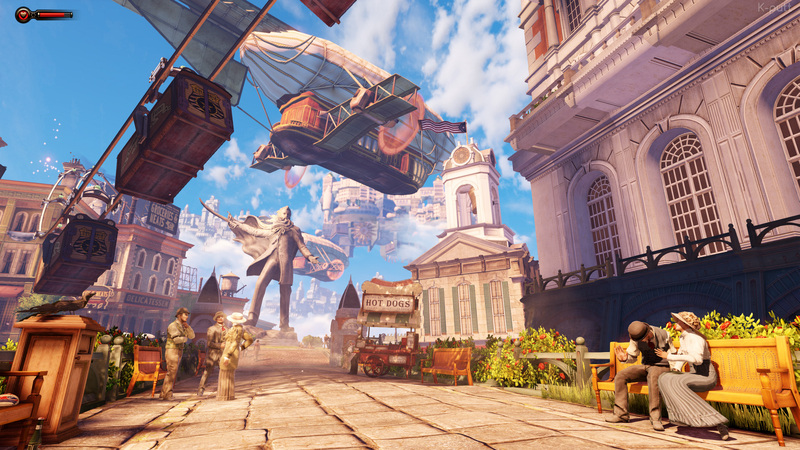 Before long, Booker makes his way to Columbia, and it becomes immediately clear that it is a very different city. And not just that it’s floating high above the earth, most noticeably, its inhabitants worship its founder as if he were a god; Comstock, or The Prophet, as he’s known to most. Having completed my first play-through nearly a month ago, it’s taken me this long to form a proper opinion and really wrap my head around the events of BioShock Infinite. Its story is deep and quite complex, and one that will likely resonate differently, depending on how much the player absorbs and comprehends. Having played BioShock, I went into Infinite fully expecting a twist at some point, and it felt as if Irrational knew this would be the case for many people, and took steps to ensure there would still be some shocking moments. It was clear to me, right from the opening scene, that things aren’t what they seem, and that a second play-through would likely reveal a fair amount of foreshadowing. I simply took in as much as I could, and put the pieces together along the way. Thankfully, just about everything was addressed and concluded by the time the credits rolled, although the last 15-20 minutes left me scratching my head initially. Once the game opens up and allows the player freedom to explore the city, things quickly take a turn for the worse, and after a rather gruesome scene, the guns come out and Booker is in the crosshairs. As you would expect, Infinite sticks to the BioShock combo in terms of combat. The usual arsenal of guns are at your disposal, along with spells that range from shooting electricity bolts, to lobbing fire bombs, to possessing enemies and turrets, and more. The spells compliment the guns nicely, or maybe it’s the other way around? For instance, you can zap enemies with electricity, then shoot them and their heads will explode… every, single, time. There are achievements tied to weapon and spell use, so I found myself constantly changing up my go-to weapons in order to nab them. Surprisingly, I enjoyed using all of them, and didn’t feel hindered by constantly switching it up. Elizabeth. It’s pretty clear that she’s at the centre of, well, everything. But it’s not clear what role she plays, or why she’s so important. All Booker knows, is that he has to leave Columbia with her. 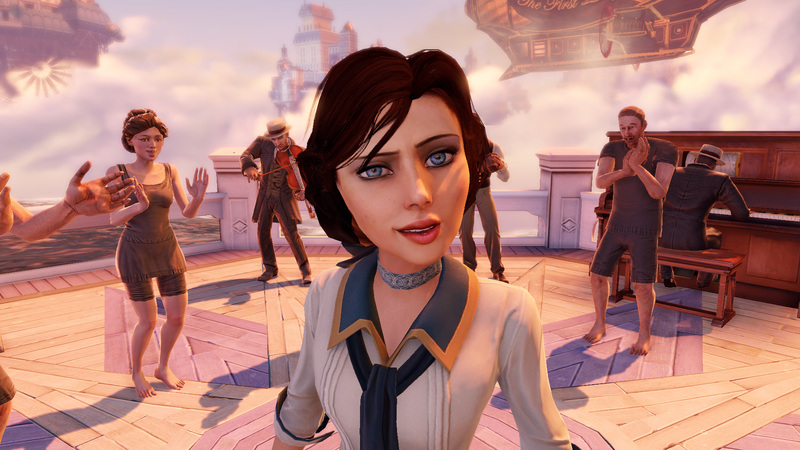 The moment when Booker and Elizabeth are first together, a text prompt appears letting the player know that Elizabeth can take care of herself, which was a huge relief. I really didn’t want to have to babysit this broad for the bulk of the game, and that certainly was not the case. In fact, Elizabeth is pretty damn useful! She can pick locks, open safes, find money for you, and even restock your ammo, health, and salts (used for powers) as they’re depleted in combat scenarios. There isn’t much that needs to be said about the visuals. The environments are absolutely stunning, and character animation is very good. Especially as far as Elizabeth is concerned. Her face is very expressive, and can be utterly heartbreaking at times. The music sets the mood perfectly, and is quite different from what I’ve come to expect from blockbuster titles. There’s no full orchestral score here. Most songs are performed by only a handful of instruments, but they truly fit the era. There’s a little Easter egg about half way through the game, which was one of my favourite moments, where Booker stumbles upon a guitar propped up against a chair. Once the player interacts with it, Booker sits down and begins to play, while Elizabeth accompanies him. The song she sings is echoed through-out the game several times. I likely spent 15 hours on my first play through, as I was keeping an eye out for the collectible items and scouring every corner for loot. Although I haven’t returned to it since completing the story a few weeks ago, I have no intentions on selling BioShock Infinite or trading it in. I will definitely be playing it again, and have a feeling I’ll enjoy it just as much, if not more the second time through. The bar that BioShock set back in 2007 has indeed been raised.